Dec. 4 (Bloomberg) -- Crude oil may dip below $25 a barrel next year if the recession that’s slashing fuel demand around the world spreads to China, Merrill Lynch & Co. said. Global oil demand will contract in 2009 as economic growth slows to its weakest since 1982, Merrill Commodity Strategist Francisco Blanch said in a report today. In October, when oil was around $100 a barrel, the bank predicted that prices may slide to $50. Crude traded at $45.30 in New York today, the lowest since February 2005. Crude hasn’t fallen below $25 a barrel on the New York Mercantile Exchange since November 2002. Global oil demand has slumped as the U.S., Europe and Japan face simultaneous recessions for the first time since World War II. The number of Americans collecting jobless benefits rose to 4 million in the week to Nov. 22, a 26-year high, the Labor Department reported today. European Central Bank President Jean- Claude Trichet said the euro region’s economy will shrink in 2009. Merrill reiterated a Nov. 26 forecast that oil futures traded in New York will average $50 a barrel next year. Prices “could find a trough” at the end of the first quarter and undergo a “modest recovery” in the second half as economies strengthen, according to today’s report. “We expect strong cooperation to emerge” among members of the Organization of Petroleum Exporting Countries as prices fall below $50, Blanch said. OPEC, producer of more than 40 percent of the world’s crude, was still pumping about 1 million barrels a day more than its official target of 27.3 million barrels a day last month, according to a Bloomberg survey. Producers in Canada may shutter almost 800,000 barrels a day if prices decline below $35 a barrel, Blanch added. Merrill’s $50-a-barrel assessment for 2009 is the second- lowest among 32 analyst estimates compiled by Bloomberg, after a prediction of $43.13 by ANZ Banking Group Ltd. issued on Nov. 18. Dec. 4 (Bloomberg) -- Gold prices fell for the second straight day as commodities and equities tumbled on concern the global recession will deepen. Silver also dropped. The Reuters/Jefferies CRB Index of 19 raw materials touched the lowest level since September 2002, led by tumbling energy prices. Some Federal Reserve officials have expressed concern about the risks of deflation. Gold often climbs on demand for a hedge against rising consumer prices. The Dow Jones Industrial Average dropped as much as 3.4 percent. “Deflationary fears are helping some modest pressure on gold,” said Stephen Platt, a commodities analyst at Archer Financial Services Inc. in Chicago. Gold futures for February delivery dropped $5, or 0.6 percent, to $765.50 an ounce on the Comex division of the New York Mercantile Exchange. The metal dropped 1.6 percent yesterday. Silver futures for March delivery fell 7 cents, or 0.7 percent, to $9.52 an ounce. Gold is down 8.7 percent this year, while silver has tumbled 36 percent. The CRB index has slid 39 percent. Earlier today, gold gained as much as 2.5 percent as the dollar declined. The metal generally moves in the opposite direction of the greenback. Still, “commodities will struggle to recover any ground as the economic downturn has further to go, and we expect more bad news over the next few months,” Standard Chartered Plc analysts Helen Henton and Dan Smith said in a report. “Gold will trade in a broad sideways trend in the months ahead,” partly on recession concerns, the analysts said. In the second half of 2009, “gold should regain some substantial investment demand” and may rally to above $900, the analysts said. Gold assets held in exchange-traded funds managed by ETF Securities Ltd. rose to 1.708 million ounces, from 1.615 million on Dec. 2, the Jersey, Channel Islands-based company said today. Dec. 5 (Bloomberg) -- Crude oil was little changed below $44 a barrel, near the lowest price since January 2005, as gasoline futures dropped under $1 a gallon and the recession in the U.S., Europe and Japan cut fuel consumption. Prices may dip below $25 a barrel next year if the contraction spreads to China, Merrill Lynch & Co. said in a report yesterday. Oil has dropped 19 percent this week, and is poised for its biggest percentage decline since March 2003. “We’ve got the U.S., U.K., Europe and Japan all in recession for the first time since World War II, and the oil market is reacting,” said Chip Hodge, a managing director at MFC Global Investment Management in Boston, who oversees a $5 billion energy-company bond portfolio. Crude oil for January delivery rose 15 cents, or 0.3 percent, to $43.82 a barrel at 11:12 a.m. Sydney time on the New York Mercantile Exchange. Oil prices have tumbled 70 percent since reaching a record $147.27 on July 11. Yesterday, futures tumbled $3.12, or 6.7 percent, to $43.67 a barrel, the lowest settlement price since Jan. 5, 2005. Gasoline for January delivery rose 0.5 cent, or 0.5 percent to 97.45 a gallon in New York. Yesterday, it declined 7.2 cents, or 6.9 percent, to 96.95 cents a gallon, the lowest settlement since the contract was introduced in October 2005. Pump prices have followed futures lower. Regular gasoline, averaged nationwide, dropped 1.4 cents to $1.789 a gallon, AAA, the largest U.S. motorist organization, said on its Web site yesterday. It’s the lowest since January 2005. The fuel has fallen 57 percent from the record $4.114 a gallon reached on July 17. Oil reached a then-record $41.15 on Oct. 10, 1990, when Iraqi troops were occupying Kuwait. The milestone held until May 2004. Prices were last below $40 a barrel in July 2004. Royal Dutch Shell Plc said that a fire broke out yesterday at its Pernis refinery in the Netherlands, the largest in Europe. The blaze started at the gasoline-making catalytic cracker at the 416,000 barrel-a-day plant, the Rotterdam fire department said. Prices of heating fuels dropped for a second day. Heating oil for January delivery fell 0.11 cent to $1.5080 a gallon in New York. Yesterday, it dropped 7.49 cents, or 4.7 percent, to settle at $1.5091 a gallon, the lowest since Jan. 22, 2007. Natural gas for January delivery fell as much as 1.9 percent to $5.902 per million British thermal units, the lowest since Sept. 21 last year. It lost 33 cents, or 5.2 percent, yesterday to $6.017 per million British thermal units, the lowest settlement since Sept. 20, 2007. U.S. fuel demand during the four weeks ended Nov. 28 was down 6.2 percent from a year earlier, an Energy Department report showed Dec. 3. The four-week average of petroleum products supplied in the U.S. was 19.3 million barrels a day, down from 20.5 million barrels a day a year ago, the report showed. The U.S. Labor Department will probably say today that payrolls in November dropped the most since the 2001 terrorist attacks, a Bloomberg news survey showed. The U.S. entered a recession in December 2007, the National Bureau of Economic Research, a private, non-profit panel of economists that dates American business cycles, said on Dec. 1. European Central Bank President Jean-Claude Trichet said the euro region’s economy will shrink next year for the first time since 2003. Qatar’s oil minister said Dec. 3 that the Organization of Petroleum Exporting Counties will “definitely” cut output at its next meeting in Algeria on Dec. 17. OPEC oil ministers agreed on Oct. 24 in Vienna that the 11 members with quotas would lower supply by 1.5 million barrels a day starting in November. Production by the 11, excluding Iraq and Indonesia, declined 725,000 barrels to 28.24 million barrels a day last month, according to data compiled by Bloomberg News. U.S. crude-oil supplies fell 456,000 barrels to 320.4 million barrels last week, the Energy Department said Dec. 3. It was the first decline in 10 weeks. Brent crude oil for January settlement fell $3.16, or 7 percent, to $42.28 a barrel yesterday on London’s ICE Futures Europe exchange, the lowest settlement since Jan. 5, 2005. Dec. 5 (Bloomberg) -- The dollar headed for a fifth weekly decline against the yen, its longest losing streak in four years, before a U.S. report forecast to show the highest unemployment rate since 1993. The greenback was also on course for a second weekly drop versus the euro as an expected contraction in nonfarm payrolls may add to the case for the Federal Reserve to lower interest rates. The euro fell against the yen this week, while the British pound declined versus the greenback. European Central Bank President Jean-Claude Trichet delivered the biggest interest-rate cut in the bank’s 10-year history and the Bank of England reduced its main interest rate to the lowest level since 1951. The dollar bought 92.34 yen as of 8:09 a.m. in Tokyo from 92.23 yen late yesterday in New York, on course for a 3.3 percent decline this week. The euro traded at $1.2768, little changed from yesterday and up from $1.2691 at the end of last week. The euro was quoted at 117.93 yen, down 2.7 percent from Nov. 28. The pound stood at $1.4683, down 4.5 percent this week. The dollar may fall to 88 yen this month, Amikura said. U.S. payrolls shrank by 333,000 workers in November after a drop of 240,000 in the previous month, according to the median forecast of 73 economists surveyed by Bloomberg News. The jobless rate jumped to 6.8 percent, the highest level in 15 years, according to the median forecast. The Labor Department will release the report at 8:30 a.m. in Washington. Fed Chairman Ben S. Bernanke yesterday urged the use of more taxpayer funds for new efforts to prevent home foreclosures, saying in a speech in Washington that the private sector is incapable of coping with the crisis on its own. Futures on the Chicago Board of Trade showed yesterday 72 percent odds the Fed will lower its 1 percent target rate to 0.25 percent on Dec. 16, compared with a 52 percent chance on Dec. 3. The ECB lowered its main refinancing rate by 0.75 percentage point to 2.5 percent. The median forecast of 57 economists surveyed by Bloomberg News was for a reduction of half a percentage point. Sterling fell as much as 1.4 percent to 87.26 pence per euro yesterday, the weakest level since the 15-nation currency’s 1999 debut, after the BOE lowered its target lending rate by a full percentage point to 2 percent. The pound was last quoted at 86.97 pence per euro, on course for a 5.1 percent weekly decline. FCPO 3rd month January futures contract plunge RM74 to closed RM1462 as compare to previous trading session with 5247 lots traded in the market. CPO price was traded lower as crude oil and soybean oil was traded lower during the trading session. Technically, CPO price plunge after CPO price fails to hold above support level RM1533 region; 61.8% Fibonacci retracement levels. 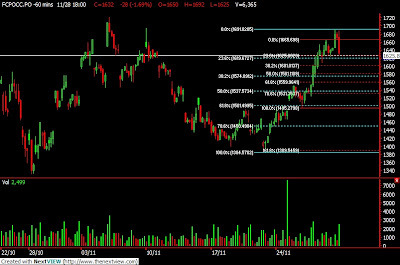 Despite CPO price fails to hold above RM1533, CPO price was seen have final resorts at RM1450 region at 78.6% Fibonacci retracement levels. Traders were advice to temporary stay out from the market in order to have clearer view on the CPO price movement. However, CPO price was still preferable to call for long position in the coming trading session. Resistances were seen at RM1500 and RM1560 region. FKLI November futures contract traded 4 points higher compare to previous trading session to close at 843 with total of 3897 lots traded in the market. FKLI was mainly traded sideways during entire trading session as traded volume shows lack of market participant to trade FKLI as market lack of leads to move toward a certain direction. Technically, FKLI was seems temporary supported above 836 and 830 region; 61.8% Fibonacci retracement figure from 2 different range. However, Guppy Multiple Moving Average shows great resistance at 845 to 850 regions. Traders were advice to ONLY hold long position in the coming trading session provided if resistances level around 845 was breach while support levels were not violated. MUMBAI, Dec 4 (Reuters) - India soybean futures fell on Thursday tracking weak international prices and a rise in arrivals at spot, analysts said. At 10:40 a.m., January futures NSBF9 on the National Commodity and Derivatives Exchange fell 1.11 percent to 1,654 rupees per 100 kg. At 10:41 a.m., February palm oil KPOc3 on the Bursa Malaysia Derivatives Exchange was down 0.59 percent at 1,527 ringgit a tonne. Soybean is crushed to produce soyoil, which competes with palm oil. The prices of the two edible oils therefore often move in tandem. However, soybean's losses were limited after Indian commodity exchanges relisted soyoil after a gap of about seven months. Soybean is crushed to produce soyoil. Lifting the official suspension on soyoil is a sign the government wants to support edible oil prices, they added. FCPO February futures contract plunge RM67 lower compare to previous trading session and close at RM1536 with a total 6243 lots traded in the market. CPO price was traded lower yesterday as crude oil and soybean oil plunge during overnight trading as well electronic trading sessions. Technically, CPO seems searching for support levels and temporary supported above RM1533 region; 78.6% Fibonacci retracement figures. Provided if support levels at RM1533 and RM1500 is well hold above, we expect CPO price would traded upwards to complete wave 5 projected at RM1642 as 1st resistances level while RM1708 was seen next resistance levels. FKLI November contract retrace 4 points lower compare to previous trading session to close at 839 with a total of 5252 lots traded in the market. FKLI was traded lower during the trading session due to weak regional indices performance and Dow Jones futures electronic sudden fall leads FKLI sharp retrace from 847 regions. Technically, FKLI seems encounter some great resistance levels at 850 regions and traded lower to test FKLI current support levels. FKLI temporary support was seen at 830 and 803.5 regions. Traders were advice to ONLY hold long position provided if support levels were not violated. Resistances were seen at 850 and 870 region. NUSA DUA, Indonesia Dec 2 (Reuters) - Asian palm oil exports are set to grow as more soybean oil gets channelled into the biodiesel sector but the tropical oil could find itself in competition with sunoil for a bigger share of the food market, a leading industry analyst said on late Tuesday. Sunoil is considered to be a premium, much healthier oil and recent drops in commodity prices as well as swelling stocks have led to a rush of orders from North Africa to India, said Siegfried Falk, co-editor of Hamburg-based research firm Oil World. NUSA DUA, Indonesia Dec 2 (Reuters) - India, the world's second largest vegetable oil importer, could tax crude palm oil shipments within a month, top industry analyst Dorab Mistry said on Tuesday. "It will happen. When you say soon, it will be within a month and something will happen," Mistry told Reuters in an interview ahead of a palm oil conference in the resort island of Bali. "They have given us the indication by a level of 20 percent on soybean oil, so usually we have seen in historical terms, they try to put both (soybean oil and palm oil) at the same level playing field." Dec. 3 (Bloomberg) -- OPEC, supplier of more than 40 percent of the world’s oil, will “definitely” cut output at its next meeting in Algeria on Dec. 17 after postponing a decision last month, Qatar’s oil minister said. Ministers from OPEC postponed debate on a second cut in output in as many months during meetings in Cairo on Nov. 29. OPEC members said they would wait to gauge the effect of a 1.5 million-barrel cut agreed to on Oct. 24. OPEC is likely to lower output as it seeks oil at $75 a barrel, Secretary General Abdalla el-Badri said Dec. 1. OPEC members aren’t yet complying with existing cutbacks that started a month ago, according to PetroLogistics Ltd. The Geneva-based tanker-tracking consultant estimates that the 11 OPEC states subject to output quotas produced 27.8 million barrels a day in November, which is 500,000 barrels a day in excess of their official limit of 27.3 million barrels a day. Crude oil rebounded from a three-year low today on speculation OPEC will cut production further this month to check the collapse in prices. Oil for January delivery rose as much as $1.14, or 2.4 percent, to $48.10 a barrel in after-hours electronic trading on the New York Mercantile Exchange. Yesterday, futures fell 4.7 percent to $46.96 a barrel, the lowest settlement since May 20, 2005. Oil has tumbled 67 percent from a record $147.27 a barrel hit on July 11 and is set to decline 50 percent this year, snapping six years of gains. OPEC President Chakib Khelil said the group will need six months to remove excess crude oil from the market and push prices up, the Algerian newspaper El Moudjahid reported today. Oil industry inventories should ideally be equal to about 52 days worth of demand, Saudi Arabia Oil Minister Ali al-Naimi said on Nov. 29 in Cairo. Stockpiles exceeded that level in the third quarter, reaching about 55 days of forward demand, according to the International Energy Agency. Oil ministers including al-Attiyah are concerned that demand may weaken further, perhaps at a faster rate than they can curb supply, as a slowing global economy cuts consumption. Dec. 3 (Bloomberg) -- Gold fell in New York as the dollar strengthened and deflation concerns mounted, reducing the appeal of the metal as an alternative investment. Silver also declined. The dollar rose against the euro as economists forecast a rate cut tomorrow by the European Central Bank. Gold often moves inversely to the U.S. currency. Some investors buy the metal to preserve value when consumer prices rise. Excluding food and fuel costs, the U.S. consumer price index fell in October for the first time since 1982, government figures show. Gold futures for February delivery fell $12.80, or 1.6 percent, to $770.50 an ounce on the Comex division of the New York Mercantile Exchange. The metal tumbled 5.2 percent on Dec. 1, the most since March, and is down 8.1 percent this year. Silver futures for March delivery slipped 2.5 cents, or 0.3 percent, to $9.59 an ounce on Comex. The metal has dropped 36 percent this year. Gold is headed for an annual decline for the first time in eight years, while the U.S. Dollar Index, a gauge that includes six major currencies, is poised for its first advance in three years. The index, which gained 0.4 percent today, rose 9.6 percent in the third quarter, while gold fell 5.1 percent. The CPI declined 1 percent in October, the most since records began in 1947, according to the U.S. Labor Department. Federal Reserve policy makers predicted the U.S. economy will contract until the middle of next year, with some officials concerned about the risks of deflation, according to minutes of their Oct. 28-29 meeting. Confronting what may be the worst recession since World War II, the Fed will cut its target bank-lending rate at a Dec. 16 meeting by a quarter of a percentage point, to 0.75 percent, according to economists surveyed by Bloomberg News. The Fed has reduced its benchmark interest rate by 4.25 percentage points since September 2007, to 1 percent. Other central banks are lowering borrowing costs. In New Zealand, the Reserve Bank cut its benchmark rate by a record 1.5 percentage points to 5 percent. In the U.K., the Bank of England is expected to slash its key lending rate by a third to 2 percent tomorrow, while the rate for the euro region may be trimmed a half-percentage point to 2.75 percent. “It looks like the ECB will be cutting rates more than originally expected, and if they do, the dollar will strengthen and we may see weaker metals prices,” Perez-Santalla said in a report earlier today. A global recession may curb demand for all raw materials, and prompt some investors to sell precious metals to raise cash and cover losses in other markets, some analysts said. The Reuters-Jefferies CRB Index of 19 raw materials fell as much as 1.2 percent today to a six-year low. The index has dropped 37 percent this year. Dec. 3 (Bloomberg) -- Crude oil fell after an Energy Department report showed that U.S. refineries curbed operating rates as the recession crimps fuel demand. Refineries operated at 84.3 percent of capacity, down 1.8 percentage points from the week before. It was the biggest one- week drop since September, when hurricanes Gustav and Ike struck the Gulf Coast. A 0.4 percentage-point increase was forecast. The report showed that total fuel use was down from a year earlier. Crude oil for January delivery fell 17 cents, or 0.4 percent, to $46.79 a barrel at 2:42 p.m. on the New York Mercantile Exchange, the lowest settlement since Feb. 9, 2005. Futures have tumbled 68 percent since reaching a record $147.27 on July 11. Consumption averaged 19.6 million barrels a day last week, up 0.6 percent from the week before and down 5.7 percent from a year earlier, according to the report. Gasoline demand rose as consumption of distillate fuel, a category including diesel and heating oil, dropped, the report showed. Crude-oil supplies fell 456,000 barrels to 320.4 million barrels last week, the department said. It was the first decline in 10 weeks. Inventories were forecast to climb 1 million barrels, according to the median of 13 responses in a Bloomberg News survey. Supplies at Cushing, Oklahoma, where New York-traded West Texas Intermediate oil is stored, rose 2.35 million barrels to 22.9 million last week. The increase left inventories the highest since June 2007. Gasoline stockpiles dropped 1.53 million barrels to 198.9 million in the week ended Nov. 28, the report showed. Supplies of distillate fuel, a category that includes heating oil and diesel, fell 1.72 million barrels to 125 million last week. Brent crude oil for January settlement settled unchanged at $45.44 a barrel on London’s ICE Futures Europe exchange. Futures touched $44.87, the lowest since Feb. 14, 2005. Dec. 3 (Bloomberg) -- The yen may decline for a second day against the euro on speculation interest-rate cuts world wide will stem an economic slump, reducing the appeal of the currency as a safe haven. The yen may also fall against the Australian and New Zealand dollars on speculation a rally in U.S. stocks will spread to Asian shares, encouraging purchases of higher-yielding assets funded with currencies where interest rates are lower. The yen traded at 118.56 per euro at 8:09 a.m. in Tokyo from 118.44 late yesterday in New York, when it fell 0.8 percent. The yen was little changed at 93.28 against the dollar, compared with 93.18. The euro was quoted at $1.2716 from $1.2714. The yen may decline to 119 per euro today, Ishikawa said. Central bankers will lower interest rates by 1.5 percentage points to 5 percent in New Zealand, 1 percentage point to 2 percent in the U.K. and a half-percentage point to 2.75 percent in the euro region this week, according to the median forecasts of analysts surveyed by Bloomberg. The yen depreciated 0.7 percent to 9.1227 versus the rand on speculation investors will slow the unwinding of carry trades, in which they get funds in a country with low borrowing costs and buy assets where returns are higher. The Bank of Japan kept its target lending rate at 0.3 percent yesterday, compared with 12 percent in South Africa. The Standard & Poor’s 500 Index rose 4 percent yesterday, a day after the biggest rout since mid-October. Europe’s Dow Jones Stoxx 600 Index gained 1.7 percent. ADP Employer Services may report today that companies in the U.S. cut 205,000 jobs last month, following a reduction of 157,000 in October, according to the median forecast of 22 economists surveyed by Bloomberg News. The report is due 8:15 a.m. New York time. Payrolls including government employees shrank by 325,000 workers in November, the biggest one-month drop since the 2001 terrorist attacks, according to the median forecast of economists before the Labor Department’s Dec. 5 report. Foreign-exchange funds had their biggest monthly returns in October since 2003 as investors sold higher-yielding assets and bought the U.S. dollar, Parker Global Strategies LLC said yesterday. Currency funds gained 2.53 percent, according to the Stamford, Connecticut-based firm, whose Parker FX Index tracks 68 firms managing more than $36 billion in assets. Federal Reserve Chairman Ben S. Bernanke said on Dec. 1 he may use less conventional policies, such as buying Treasury securities, to revive the economy because there is limited room to lower the target lending rate from the current 1 percent. Dec. 2 (Bloomberg) -- Gold rose, rebounding from the biggest decline in eight months, as the dollar dropped, boosting the appeal of the precious metal as an alternative investment. Silver also gained. The dollar fell as much as 0.5 percent against a weighted basket of six major currencies before paring losses. Gold and other metals often move in the opposite direction of the U.S. currency. Gold is headed for an annual decline after seven straight yearly gains, while the dollar is poised for the first advance in three years. Gold futures for February delivery rose $6.50, or 0.8 percent, to $783.30 an ounce on the Comex division of the New York Mercantile Exchange. The metal tumbled 5.2 percent yesterday, the most since March. Silver futures for March delivery climbed 23.5 cents, or 2.5 percent, to $9.615 an ounce. The metal is still down 36 percent this year. The dollar fell on speculation that central banks will cut borrowing costs to spur economic growth. Federal Reserve Chairman Ben S. Bernanke said yesterday he may use less conventional policies, such as buying Treasury securities, to revive the economy. The Fed’s benchmark interest rate is 1 percent. Central bankers will lower rates this week by 1.5 percentage points to 5 percent in New Zealand, 1 percentage point to 2 percent in the U.K. and a half-percentage point to 2.75 percent in the euro region, according to the median forecast of analysts surveyed by Bloomberg. The dollar rose 9.6 percent in the third quarter against the basket of currencies, while gold fell 5.1 percent. Still, a global recession may damp demand for all raw materials, and some investors will be forced to sell precious metals to raise cash and cover losses in other markets, some analysts said. Today, the Reuters/Jefferies CRB Index of 19 raw materials touched the lowest level since April 2003. Gold has dropped 6.5 percent in 2008. Dec. 3 (Bloomberg) -- Crude oil rose for the first time in four days as U.S. equities rallied and the Federal Reserve extended terms of three emergency loan programs to mitigate the credit crisis. Prices rebounded after reaching a three-month low yesterday, capping a decline of more than $100 from July’s record on speculation the U.S., the world’s largest energy consumer, may be in the longest slump since World War II. “It’s all about demand, demand, demand,” said Kyle Cooper, an analyst at IAF Advisors in Houston. Crude oil for January delivery gained 44 cents, or 0.9 percent, to $47.40 a barrel at 10:06 a.m. Sydney time on the New York Mercantile Exchange. Yesterday, futures fell $2.32, or 4.7 percent, to $46.96 a barrel, the lowest settlement since May 20, 2005. Oil has tumbled 68 percent in New York since reaching $147.27 a barrel on July 11. Fuel demand dropped as the U.S., European and Japanese economies slowed. The U.S. first entered a recession in December 2007, the panel of economists that dates American business cycles said Dec. 1. Gasoline for January delivery declined 5.29 cents, or 4.8 percent, to settle at $1.0583 a gallon yesterday in New York. Pump prices have followed futures lower. Regular gasoline, averaged nationwide, dropped 0.8 cent to $1.812 a gallon, AAA, the largest U.S. motorist organization, said on its Web site yesterday. It’s the lowest price since January 2005. The fuel has tumbled 56 percent from the record $4.114 a gallon reached on July 17. The Organization of Petroleum Exporting Countries, the International Energy Agency and the U.S. Energy Department slashed demand projections in November because of the economic outlook. U.S. fuel consumption during the four weeks ended Nov. 21 was down 6.6 percent from a year earlier, the department said in a report last week. Prices are also lower because OPEC ministers put off debate on a second cut in output in as many months during a Nov. 29 meeting in Cairo. “We won’t see the oil market rebound until either OPEC makes a substantial production cut or the economy begins to recover and we start to see demand for refined products firm up,” said Gene McGillian, an analyst at Tradition Energy in Stamford, Connecticut. Prices plunged more than 9 percent Dec. 1 after OPEC’s last meeting. OPEC will reduce crude production when it meets in Oran, Algeria, this month, OPEC Secretary General Abdalla el-Badri said Dec. 1. Oil prices will extend declines during the next 12 to 18 months if OPEC fails to implement “sufficient cuts” and supply stays at current levels, according to Christof Ruehl, the chief economist of BP Plc, Europe’s second-largest oil producer. The world economy will stage a recovery from recession in 18 to 24 months, followed by “possible spikes” in oil prices, Ruehl told a conference in London yesterday. Hedge-fund managers and other large speculators increased their bets that New York crude-oil futures would drop in seven of the past eight weeks, according to a U.S. Commodity Futures Trading Commission data. “Most of the drop is due to speculators de-leveraging,” said Joan McCullough, macro strategist at East Shore Partners, a brokerage in Hauppauge, New York. The gain in oil prices to a record earlier this year was caused by speculators and not an imbalance in supply and demand, Saudi Arabian Oil Co. Chief Executive Officer Abdullah Jum’ah said on Nov. 26 in New Delhi. Saudi Aramco is the world’s largest state oil company. The Fed extended the terms of the emergency-financing programs to April 30 from January 30, aligning their expiration dates with other central bank efforts to mitigate the global credit crisis. The programs enable financial institution to obtain loans that are no longer available from private investors at affordable rates. A U.S. Energy Department report today will show that crude- oil supplies rose 1 million barrels last week, according to the median of 13 responses in a Bloomberg News survey. It would be the 10th consecutive weekly gain. Stockpiles of gasoline and distillate fuel, a category that includes heating oil and diesel, also rose, according to the survey. Brent crude oil for January settlement declined $2.53, or 5.3 percent, to $45.44 a barrel on London’s ICE Futures Europe exchange yesterday, the lowest settlement since Feb. 15, 2005. FCPO February futures contract retrace RM25 lower compare to previous trading session and close at RM1603 with a total 5598 lots traded in the market. CPO price was traded lower yesterday as crude oil and soybean oil overnight trading plunge during the trading session but manage to recover as electronic trading shows signs of recovery. Technically, CPO price retrace 61.8% Fibonacci retracement figures at RM1570 region and surge up during 2nd trading session after breach the neckline resistance levels at RM1580 complete double bottom formation at RM1560 regions. Traders were advice traders to hold long position in the coming trading provided if CPO price manage to breach resistance levels at RM1642 and RM1670 region while supports were seen at RM1597 and RM1570 region. FKLI November contract plunge 18.5 points lower compare to previous trading session to close at 848 with a total of 6964 lots traded in the market. 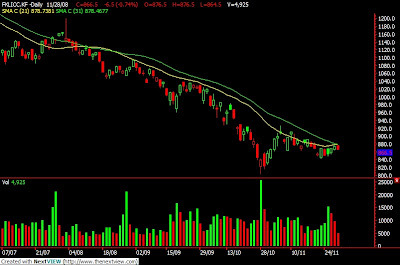 FKLI was traded lower during trading session as Dow Jones Futures electronic trading plunge despite that regional index is consider holding firm against the selling pressure. Dec. 1 (Bloomberg) -- Gold tumbled the most in eight months on speculation that the slumping global economy will damp demand for commodities. Silver plunged more than 8 percent. Equities in Asia, Europe and the U.S. fell following reports that showed manufacturing in China contracted last month by the most since at least 2005. Industrial declines in Europe and the U.K. also deepened. Gold is headed for an annual drop after seven straight yearly gains. Gold futures for February delivery fell $42.20, or 5.2 percent, to $776.80 an ounce on the Comex division of the New York Mercantile Exchange, the biggest percentage decline for a most-active contract since March 19. Silver futures for March delivery dropped 85 cents, or 8.3 percent, to $9.38 an ounce, the largest drop since Oct. 10. The metal is down 37 percent this year. The Reuters/Jefferies CRB Index of 19 raw materials was down 3.2 percent and has dropped 35 percent this year. The dollar rose as much as 0.9 percent today against a weighted basket of six major currencies. Commodities often move in the opposite direction of the U.S. currency. “There’s not a lot of interest in commodities, and it’s doubtful we’ll see any interest until the funds return next year,” Lesh said. Investment in the SPDR Gold Trust, the biggest exchange- traded fund backed by bullion, was at 758.1 metric tons on Nov. 28. The fund reached a record 770.6 tons on Oct. 10. Gold gained 14 percent last month after dropping 18 percent in October. “Price advances are at risk of unraveling in the absence of a renewed weakening in the dollar or renewed inflows into gold ETFs,” Deutsche Bank AG said in a report on Nov. 28. Gold should be trading around $650 based on the value of the dollar, Deutsche Bank said. Still, gold may rise above $900 on demand for a haven, said James Turk, the founder of GoldMoney.com, which held about $400 million of gold and silver in storage for investors at the end of November. Dec. 1 (Bloomberg) -- Crude oil fell to the lowest close in more than three years after the Organization of Petroleum Exporting Countries deferred a decision to reduce output until its next meeting on Dec. 17. OPEC said it will use the time to gauge the impact of a 1.5 million-barrel-a-day reduction agreed to in October. The group will trim production at its next meeting, its secretary general said today. Slowing growth means demand will be “much lower” than expected a month ago, OPEC said after a Nov. 29 gathering. Crude oil for January delivery declined $5.15, or 9.5 percent, to $49.28 a barrel at 2:47 p.m. on the New York Mercantile Exchange, the lowest settlement since May 23, 2005. It was the biggest one-day drop since Oct. 10. Oil prices have tumbled 67 percent since reaching a record $147.27 on July 11 as the U.S., Europe and Japan face their first simultaneous recession since World War II. Gasoline for January delivery declined 9.84 cents, or 8.1 percent, to settle at $1.1112 a gallon in New York. Pump prices have followed futures lower. Regular gasoline, averaged nationwide, dropped 0.5 cent to $1.82 a gallon, AAA, the largest U.S. motorist organization, said on its Web site today. It’s the lowest price since January 2005. The fuel has tumbled 56 percent from the record $4.114 a gallon reached on July 17. OPEC ministers put off debate on a second cut in output in as many months during the Nov. 29 meeting in Cairo. The group will reduce crude production when it meets in Oran, Algeria, this month, OPEC Secretary General Abdalla el-Badri said. Oil demand is likely to drop further next year, he said. Prices around $75 a barrel would be “fair” and would support investment in new fields, Saudi Arabian Oil Minister Ali al-Naimi said over the weekend. The global market is oversupplied by more than 2 million barrels a day, Iranian Oil Minister Gholamhossein Nozari said yesterday. The U.S. economy entered a recession in December 2007, the panel that dates American business cycles said today. The declaration was made by the National Bureau of Economic Research, a private, nonprofit group of economists based in Cambridge, Massachusetts. The last time the U.S. was in a recession was from March through November 2001, according to NBER. Manufacturing in the U.S. contracted in November at the fastest pace in 26 years, putting American factories at the forefront of a global industrial slump, a report showed today. The U.S. is the biggest oil consumer. The Institute for Supply Management’s factory index dropped to 36.2, the lowest level since 1982, the Tempe, Arizona-based group reported. A reading of 50 is the dividing line between expansion and contraction. A European manufacturing index based on a survey of purchasing managers by Markit Economics dropped to 35.6 from 41.1 in October, remaining below the expansion threshold of 50 for a sixth month. That’s the lowest since the survey began in 1998 and less than an initial estimate of 36.2 published on Nov. 21. U.K. manufacturing shrank at the fastest pace in at least 16 years in November, a separate report showed. South Korea imported 73 million barrels last month, down 6.5 percent from a year earlier, the Ministry of Knowledge Economy said in an e-mailed statement today. It was the third month that imports declined. South Korea is the world’s fifth-biggest oil importer, according to the U.S. Energy Department. Brent crude oil for January settlement fell $5.52, or 10 percent, to settle at $47.97 a barrel on London’s ICE Futures Europe exchange. It was the lowest settlement since May 19, 2005. Dec. 1 (Bloomberg) -- The yen rose to a one-month high against the dollar and gained versus the euro as plunging global manufacturing and stocks prompted bets investors will buy back Japan’s currency at the expense of higher-yielding assets. The dollar advanced against the euro and the pound as investors sought shelter in U.S. government debt. The yuan dropped the most against the greenback since China ended a fixed exchange rate in 2005, while Russia’s ruble slid to a 2 1/2-year low. The U.S. economy entered a recession in December 2007, the first since 2001, the National Bureau of Economic Research said. The yen appreciated 2.5 percent to 93.19 per dollar at 4:10 p.m. in New York, from 95.52 last week, after touching 93.05, the strongest level since Oct. 28. The yen gained 3.1 percent to 117.61 per euro from 121.22. The dollar appreciated 0.6 percent to $1.2619 per euro from $1.2691, after touching $1.2583, the strongest since Nov. 24. The U.S. currency will advance to $1.20 by year-end, according to UBS. The greenback rose 3.1 percent to $1.4910 per pound and 5.1 percent to 49.92 U.S. cents versus New Zealand’s currency on speculation a deepening global slump will encourage investors to shun higher-yielding holdings for Treasuries. U.S. debt rose today, pushing the yield on the 10-year note to a record low, as Federal Reserve Chairman Ben S. Bernanke said in a speech in Austin, Texas, that the central bank may use less conventional policies, such as buying Treasuries, to revive the economy. The yield on the benchmark note was 1.31 percentage points higher than the Japanese security of comparable maturity, the narrowest difference since 1993, making the U.S. debt less attractive to investors. “The yen still has further room to go against the dollar because the currency pair still tracks the longer-term yield differential, which remains quite tight,” said David Tien, senior quantitative researcher in New York at Fischer Francis Trees & Watts, which has $27 billion in assets under management. The Institute for Supply Management’s U.S. factory index fell to 36.2 in November, the lowest level since 1982, the Tempe, Arizona-based group reported today. A reading of 50 is the dividing line between expansion and contraction. Similar gauges for the euro zone and the U.K. dropped to records. The yuan slid as much as 1 percent to 6.8849 per dollar, the weakest level since June, as the China Federation of Logistics and Purchasing reported that the nation’s manufacturing shrank in November by the most on record. The ruble fell as low as 28.0325 per dollar, the weakest since March 2006, after VTB Bank Europe’s purchasing managers’ index for manufacturing reached a record low last month. Russia has used a quarter of its foreign reserves, the world’s third- largest, to stem a 16 percent slide in the ruble against the dollar since the beginning of August. Japan’s currency gained 6.3 percent to 138.20 per pound, the biggest jump since 1973, and 6.5 percent to 49.25 against New Zealand’s dollar as the plunge in manufacturing and stocks increased bets investors will unwind carry trades, in which they get funds in a country with low borrowing costs and buy assets where returns are higher. Japan’s target lending rate of 0.3 percent compares with 6.5 percent in New Zealand, 3.25 percent in the euro zone and 3 percent in the U.K. The Standard & Poor’s 500 Index fell 8.9 percent today after surging 12 percent last week, when the Fed said it will assign $800 billion in new funding to bolster credit for homebuyers, consumers and small businesses. The Dow Jones Stoxx 600 Index of European shares dropped 6 percent. The U.S. economic contraction is a year old, already longer than the last recession, which was from March to November 2001, according to the NBER, a private, nonprofit group of economists based in Cambridge, Massachusetts. Interest rates will be lowered this week to 5 percent in New Zealand, to 4.5 percent from 5.25 percent in Australia, to 2 percent in the U.K. and to 2.75 percent in the euro region as central banks move to stem the economic slowdown, according to the median forecasts of analysts surveyed by Bloomberg. “Aggressive rate cuts from the central banks meeting this week are required and will ensure the dollar and yen remain the best-performing currencies over the coming months,” Derek Halpenny, head of currency research at Bank of Tokyo-Mitsubishi in London, wrote in a note to clients today. FCPO February futures contract retrace marginally RM4 lower compare to previous trading session and close at RM1628 with a total 7482 lots traded in the market. CPO price was traded lower yesterday as crude oil and soybean oil electronic trading was traded lower during the trading session. Technically, CPO price seems temporary supported at RM1600 and RM1594 region; 50% Fibonacci retrace figures from RM1496 to RM1692 range. Provided if support levels at RM1600 and RM1550 were not violated, CPO price were expected to surge towards RM1770 region. Traders were advice to hold long position around the support region at RM1600 and RM1550 while being cautious around resistances area at RM1708 and RM1770 region. Technically, FKLI was seen break down from rising wedge in the hourly chart which projected price was seen at 842.5 regions. However, we expect FKLI would test 78.6% Fibonacci figure at 830 regions. 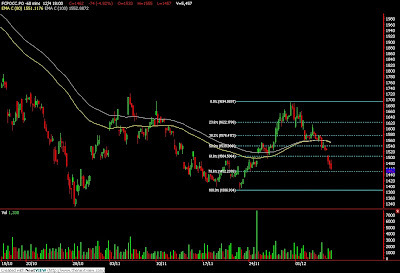 Traders were advice to only hold long position provided if support at 842.5 and 830 were manage to hold firm against the selling pressure. Resistances were seen at 865 and 880 region. Dec. 1 (Bloomberg) -- Sime Darby Bhd., the Malaysian palm oil producer, car seller and homebuilder, headed for a 12-month low in Kuala Lumpur trading after slashing its full-year profit target to account for the economic slowdown. The stock lost 7.7 percent to 5.4 ringgit at 10:21 a.m. local time. The new earnings goal is 34 percent lower than the average analyst forecast compiled by Bloomberg. Goldman Sachs Group Inc. cut its price target on Sime Darby stock. The Kuala Lumpur-based company almost halved its net income target on Nov. 28 to 1.9 billion ringgit ($524 million) in the year ending June 2009. Palm oil, the biggest contributor to Sime Darby’s profit, has tumbled and the global recession has weakened demand for the group’s houses and vehicles. “Sime may face earnings and recommendation downgrades in the short term,” Ong Chee Ting, an analyst at Aseambankers Malaysia Bhd., wrote today in a report, repeating his “fully valued” rating. The new profit target implies “fairly weak contributions” from units other than palm oil, he said. Last fiscal year, Sime Darby reported net income of 3.51 billion ringgit, almost double the new target, after the price of palm oil soared to a record. As well as being the world’s largest producer of the edible oil, Sime Darby sells luxury cars in Hong Kong, motorcycles in China and homes across Malaysia. Goldman Sachs today cut its target price 8.9 percent to 3.6 ringgit. Dec. 1 (Bloomberg) -- A decade after OPEC failed to prevent oil from collapsing to $10 a barrel, the world’s biggest producers are delaying the action needed to arrest the steepest slide in energy prices. Ministers from the Organization of Petroleum Exporting Countries postponed debate on a second cut in output in as many months during meetings in Cairo Nov. 29. They will wait until later this month, after a slump in global economies and the popping of the commodities bubble sent oil down almost $100 from its record price in July to as low as $48.25 a barrel in New York on Nov. 21. They haven’t done enough this time around to halt the 67 percent drop. Merrill Lynch & Co., forecasting the first contraction in global demand in a quarter century, sees crude bottoming at an average $43 a barrel in the first quarter, 21 percent below where it ended last week. In December 1998, crude tumbled 61 percent from its peak to as low as $10.35 when OPEC failed to eliminate a supply glut. OPEC members, the producers of 40 percent of the world’s oil, said at the Cairo meeting that they would wait to gauge the effect of a 1.5 million-barrel cut agreed to Oct. 24. That reduction was meant to restrict OPEC’s daily output by 5.2 percent, about the same amount that Spain, the world’s ninth- largest economy, uses in a day. Ali al-Naimi, the oil minister of Saudi Arabia, OPEC’s largest exporter and its de facto leader, said in Cairo that $75 a barrel oil represents a “fair price” needed to support investment in new fields. The group’s next meeting is in Oran, Algeria, on Dec. 17. Oil fell $99.02 a barrel from its July record, making the four-month slump steeper than crude’s drop from its 1996 peak to the low set in December 1998. At that time the hesitation of countries including Iraq, Venezuela and Russia to rein in output amid the Asian financial crisis and a warm U.S. winter contributed to the decline. Now, sinking demand is the main issue as the world’s largest economies slip into recession. OPEC, the International Energy Agency and the U.S. Energy Department reduced consumption projections in November because of the economic outlook. OPEC trimmed its forecast for average oil use next year by 530,000 barrels, or 0.6 percent, and the IEA cut its estimate by 670,000 barrels, or 0.8 percent. U.S. crude-oil supplies rose for a ninth week, the longest stretch since April 2005, the Energy Department said Nov. 26. U.S. fuel demand declined the most in 27 years in the first 10 months of this year, the American Petroleum Institute reported Nov. 18. The world’s three biggest economies, the U.S., Japan and Germany, are in or close to recession. The countries represented about one-third of global demand in 2007. Oil prices may fall more as world growth slows, Fatih Birol, the IEA’s chief economist in Paris, said in an interview Nov. 27. OPEC reduced its quota 11 percent in the year through March 1999 to battle falling prices, according to data on the group’s Web site. Its decision in October to cut removed less than half that amount from the market. By June 2000, the cartel’s quota was almost 25 percent lower than the 27.5 million-barrel limit agreed to in the three months from January 1998 through March 1998. While New York-based Merrill Lynch predicts a recovery in the second half, with 2009 prices averaging $50 a barrel, Barclays Plc says crude will trade at $72.10 next quarter and average $100.50 for 2009, according to a report Nov. 21. Oil producers are depending on crude prices to support spending programs. Venezuela, the largest oil exporter in the Western Hemisphere, estimated an average price of $60 a barrel for its 2009 budget. The Latin American country depends on oil for half its public spending and more than 90 percent of exports. Russia’s 2009 spending plans are based on a forecast of $95 a barrel of Urals crude, and Finance Minister Alexei Kudrin said Sept. 16 the budget will break even next year if the price of oil averages $70 a barrel. Urals crude, Russia’s benchmark blend, was last priced at $49.60. At the same time, international oil companies, concerned falling crude may make new exploration projects unprofitable, are curtailing investment plans and slowing projects. That may affect supply when demand does recover. Producers such as Royal Dutch Shell Plc are cutting back plans to develop deposits like Canadian oil sands. Shell indefinitely postponed the second-phase expansion of its Athabasca project because of rising construction costs. Shell, based in The Hague, also delayed seeking regulatory approval for Carmon Creek. Higher cost plans require $80-a-barrel oil to be profitable, according to Merrill Lynch. Dec. 1 (Bloomberg) -- The dollar fell against the yen before U.S. reports that may show manufacturing shrank and employers cut jobs by the most since 2001 as the recession deepens. The euro fell against the dollar as traders bet the European Central Bank will trim borrowing costs this week in response to a recession. The Australian and New Zealand dollars weakened as economists forecast policy makers in both countries will cut interest rates this week as the economic outlook deteriorates. The dollar traded at 95.33 yen as of 9:27 a.m. in Tokyo from late in New York on Nov. 28. It fell to 94.61 yen on Nov. 26, the lowest since Nov. 21. The euro bought $1.2673 from $1.2691 at the end of last week. The euro was quoted at 120.80 yen from 121.22 on Nov. 28. The U.S. currency may decline to 94.80 yen and trade at $1.2550 per euro today, Shimizu said. The Australian dollar fell 0.7 percent to 65.08 U.S. cents from Nov. 28 in New York. The Aussie, as the currency is known, also weakened by 0.9 percent to 62.01 yen. New Zealand’s dollar fell 0.7 percent to 54.51 U.S. cents and 0.8 percent to 51.94 yen. The Reserve Bank of Australia will make a fourth consecutive reduction to its key rate tomorrow, cutting by 75 basis points to 4.5 percent, according to the median estimate of 20 economists surveyed by Bloomberg. New Zealand’s central bank will slash its cash rate by 150 basis points to 5 percent on Dec. 4, based on a survey of 17 economists. A basis point is 0.01 percentage point. U.S. nonfarm payrolls shrank by 320,000 workers in November following a decline by 240,000 in the previous month, according to a Bloomberg News survey before the Labor Department’s Dec. 5 report. The jobless rate may have jumped to 6.8 percent, the highest level since 1993, a separate Bloomberg survey showed. The ISM may say manufacturing shrank in November for a fourth month, according to another Bloomberg survey. The Tempe, Arizona-based ISM releases the data at 10 a.m. today in New York. The world’s largest economy contracted at a 0.5 percent pace in the third quarter and consumer spending fell at a 3.7 percent rate, the biggest tumble since 1980, the government said last week. The global economy is grappling with recession as financial institutions worldwide racked up $967 billion in losses on mortgage derivatives since the start of 2007, leading to a credit market seizure and declines in company and personal spending. The euro fell for a fifth day against the yen, its longest stretch since Oct. 6, on speculation the European Central Bank will cut interest rates this week to revive growth. A report on Nov. 28 showed Europe’s inflation rate dropped to 2.1 percent in November from 3.2 percent in October, giving policy makers room to lower borrowing costs when they meet Dec. 4. Producer prices in Europe fell 0.3 percent in October from the previous month, after a 0.2 percent decline in September, according to a Bloomberg News survey of economists. That report is due tomorrow. Retail sales dropped 0.4 percent in October from the prior month, after a 0.2 percent decline in September, a separate Bloomberg survey shows. The report is due on Dec. 3. Traders increased bets the ECB will cut its 3.25 percent benchmark rate. The implied yield on Euribor futures contracts expiring in June declined to 2.42 percent on Nov. 28 from 2.44 percent on Nov. 27. Dec. 1 (Bloomberg) -- Crude oil fell in New York after the Organization of Petroleum Exporting Countries deferred for another two weeks a decision to reduce output. Slowing global growth means demand will be “much lower” than expected a month ago, OPEC said in a statement after the group’s Nov. 29 meeting in Cairo. Another reduction on Dec. 17 may not be needed if member states enacted 80 percent of the 1.5 million barrel-a-day reduction agreed in October, Al Hayat reported, citing Saudi Arabia’s Oil Minister Ali al-Naimi. “We’ve got a market that’s focused a little bit too much on the demand-side factors and perhaps less on supply,” Gerard Burg, energy and minerals economist at National Australia Bank Ltd. in Melbourne, said in a Bloomberg television interview. The impact of future cuts “will be muted by the fact that spare capacity has been on the increase,” he said. Crude oil for January delivery fell as much as $1.33, or 2.4 percent, to $53.10 a barrel in after-hours electronic trading on the New York Mercantile Exchange. It was at $53.19 at 8:30 a.m. in Singapore. The contract fell 1 cent on Nov. 28, when trading was shortened because of the Thanksgiving holiday the day before. Prices leapt 7.2 percent on Nov. 26 after China, the world’s fourth-largest economy, slashed interest rates to sustain growth and the European Union proposed $259 billion of measures to limit the impact of the global financial crisis. OPEC pumps about 40 percent of the world’s oil. Slowing demand means the global market is over-supplied by more than 2 million barrels a day, Iranian Oil Minister Gholamhossein Nozari said yesterday. Prices around $75 a barrel would be “fair” and would support investment in new fields, al-Naimi said at the weekend. Brent crude oil for January settlement fell 49 cents, or 0.9 percent, to $53 a barrel on London’s ICE Futures Europe exchange today. It rose 0.7 percent to $53.49 on Nov. 28. New York oil futures have tumbled 64 percent from their July 11 record of $147.27 a barrel as the U.S., Europe and Japan headed for their first simultaneous recession since World War II. Prices gained 9 percent last week, having reached $48.25 on Nov. 21, the lowest since May, 2005, as U.S. equity prices plunged and U.S. oil stockpiles rose for an eighth week. “The oil market is really struggling for direction,” National Australia’s Burg said. “The prospect of cuts in future might tend to stabilize the crude market for the short-term” and prices have established “something of a floor” at $50, he said. A report today in the U.S., the world’s largest oil consumer, will probably show manufacturing contracted for a fourth straight month in November, according to a survey of economists. The forecast decline will take the Institute for Supply Management’s factory index to the lowest in 28 years. U.S. crude oil inventories jumped 2.3 percent to 320.8 million barrels in the week ended Nov. 21, the most in six months, according to Energy Department data. Global stockpiles are equivalent to about 56 days of demand, when 52 days would be usual this time of year, OPEC Secretary General Abdalla el-Badri said Nov. 27. Weak near-term oil prices have made it viable for companies to hire supertankers to store the commodity for later use, Frontline Ltd. Chief Executive Officer Jens Martin Jensen said Nov. 28. The company has leased two tankers for storage and is in talks for a third, he said. Nov. 28 (Bloomberg) -- Gold prices rose in New York, capping the biggest monthly increase in nine years, on demand for a haven following terrorist attacks in India. Platinum had the biggest weekly gain since May. At least 124 people were killed and 370 were injured in almost 48 hours of violence as terrorists moved through Mumbai, India’s financial hub. Elements in Pakistan are responsible for the attacks, the Press Trust of Indian cited External Affairs Minister Pranab Mukherjee as saying. “The devastating attacks in India have added a new dimension to global jitters,” Jon Nadler, a senior analyst at Kitco Inc. in Montreal, said in a report. Gold futures for February delivery rose $7.70, or 0.9 percent, to $819 an ounce on the Comex division of the New York Mercantile Exchange. This month, the price rose 14 percent, the most since September 1999. In the week, the metal climbed 3.4 percent. Futures still are down 2.3 percent in 2008. Platinum futures for January delivery climbed $12.60, or 1.4 percent, to $882.30 an ounce on the Nymex. This week, the metal rose 6.9 percent. The November gain of 6.1 percent snapped a four-month slide. The price still is down 42 percent this year. Pakistan’s President Asif Ali Zardari said “non-state actors” were forcing their agenda on India and Pakistan and that the two governments must not allow them to succeed. Gold’s gains were limited as the dollar climbed against the euro, limiting demand for the precious metal as an alternative investment. The euro dropped as much as 2 percent against the greenback. “It doesn’t make much sense for some investors to buy gold at a time when the dollar may strengthen further,” said Sergey Grudev, an analyst at Standard Bank Russia in Moscow. The dollar may rise to $1.25 per euro in the next two months and $1.20 per euro by the end of the first quarter, he said. Gold reached a record $1,033.90 on March 17 as the euro headed for a record against the dollar. Silver futures for March delivery fell 3.9 cents, or 0.4 percent, to $10.23 an ounce. The metal rose 5.1 percent in November, ending a three-month slide. The price was up 7.6 percent in the week, the most since late September. Futures are down 31 percent this year. Palladium futures for March delivery gained $2.60, or 1.4 percent, to $194.25 an ounce. The price still gained 7.8 percent this week. In November, the metal still dropped 2.7 percent, extending the slide to five months. Futures have tumbled 49 percent this year. FCPO February futures contract retrace RM28 lower compare to previous trading session and close at RM1632 with a total 6365 lots traded in the market. CPO price plunge from RM1685 region before closing due heaving profit taking activities after 4 days surge up consecutively. Technically, CPO price plunge from RM1689 region after encounter great selling pressure at RM1700 region; 23.6% Fibonacci projection figures. However, we would recommend traders to continue to hold long position around the support region at RM1620 andRM1540 in the coming trading session provided CPO price seems temporary holding against the selling pressure. We expect CPO price would continue to surge up towards RM1770 in the coming trading session provided support regions were not violated. FKLI November contract fall 6.5 points lower compare to previous trading session to close at 866.5 with a total of 4925 lots traded in the market. FKLI closed lower during trading session due to profit taking activities. Technically, FKLI forms a Doji formation in the weekly chart with significant volume traded during the week. 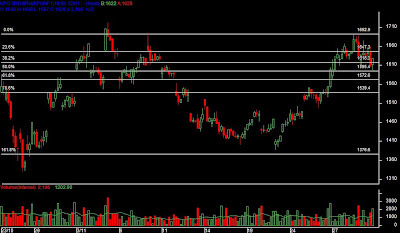 However, FKLI was expected encounter great resistances around 877 and 891 region. 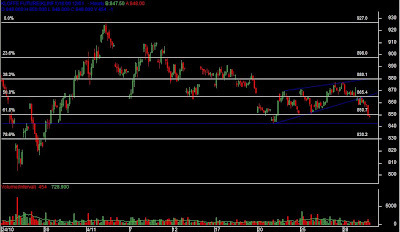 We expect FKLI would be traded higher provided if support levels at 850 and 842.5 were not violated. Traders were advice to hold long position in the coming trading session once the resistance levels were violated.